Ok in the final part of this mini series, on shooting with wide angle lenses, Im going to be getting in close, and highlighting subject matter that’s not normally associated with fisheye lenses, and thats a whole genre called Close Focus Wide Angle. So let’s have a look at using your super wide lenses for getting in close. So i’m going to pull out a few pictures where i’ve got much closer than usual with my fisheye lens for my interpretation of CFWA and share the techniques I’ve used to get them. This is what you’d call a classic CFWA shot, of a subject usually shot within the macro range.but instead of shot with a macro lens it was shot with my fisheye lens. I really had to work quite quickly here as like most fish from the Damsel family, whilst only about 2 inches long, was quite angry, and rightly so at my intrusion into it’s little patch of reef. Fiercely guarding it’s eggs which you can see as a diagonal silver patch at the bottom of the shot. It’s all about getting your exposure, strobe positioning and output sorted in advance for pictures like this, so if I have a shot like this in mind, I will have a dress rehearsal getting these factors dialled in before I go for the shot proper. How do I do this? Ok, if i’m shooting this close, I want to increase my chances of getting enough depth of field, as DoF decreases exponentially as you get closer. So i’m shooting at as small an aperture as I can that will allow me to also set a shutter speed that’s not too slow to create a double image. Although sometimes you can use this to your advantage for dramatic effect, but more of that later. Anyway, once i’ve established a baseline exposure for the ambient conditions, so the background is neither too light or dark. I then need to work out the overall exposure and lighting. Next I need to position my strobes, and adjust the output to light the feisty wee creature, and not wanting to cause it too much distress, and as I mentioned I much prefer to get the exposure and focus correct before I even get into position for the shots themselves. And I do this by using something of the same size, in this case my thumb, in the same position as I want the subject to be. So I just hold my thumb in frame, with the strobes set roughly how I’ve guessed from past experience, I move them and adjust their output until my thumb is looking correctly exposed in the test picture. To light something this close, and it was only a centimetre or so from the dome front, the strobes were positioned really close to either side of the dome. Generally this would be the case for this type of shot, and this was no different, the strobes were almost touching the dome either side of it, to ensure the light was going to sufficiently illuminate the shot. This is a technique where you don’t actually look through the viewfinder or screen, and what I did was prefocus the lens based upon the Damsel being about a centimetre form the dome, worked out when I was working out my strobe positions, with my thumb as earlier. I simply lock my focus, in my case once the camera has focused using AF, I switch it into manual focus mode, which means it wont hunt about and will be set to that position until I switch it back to auto. I do this, as in situations like this there is no gtee that the camera will pick the correct point to focus with any great precision, as the fish will be darting about. This meant that I could raise myself up but position the camera rig really close to the bottom without touching it. And the Damsel did all the hard work, as it started to dart in and try to chase away it’s own reflection in the dome. With me clicking a shot off when I saw it really close in to the dome, all of which I could see from above. It didn’t actually take that long to get this shot, once i’d established the settings, which takes far longer to explain than actually carry out. Important though that when you think you’ve got a decent picture, that you review and check it on your cameras screen by zooming in to ensure that the eye is in focus. Very close to the Damsel and to the left was a small Moray being cleaned, so all I had to do was reframe and move my strobes to either side, as I was now framing vertically, I kept all the other settings the same, and just moved the camera rig in close to the eel. 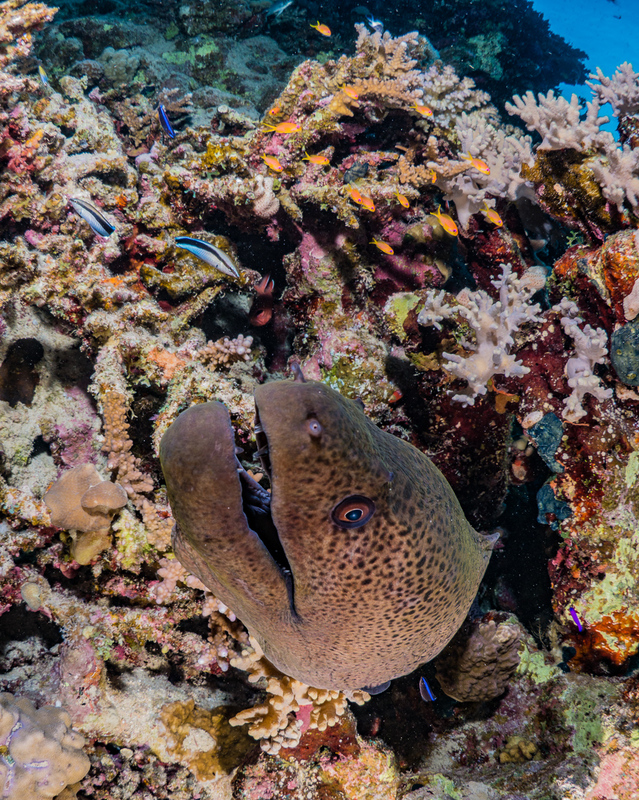 The Barge is jam packed with subjects to shoot, so I could keep the camera set up pretty much the same and just reframe to get this shot of a Moray cleaning station. 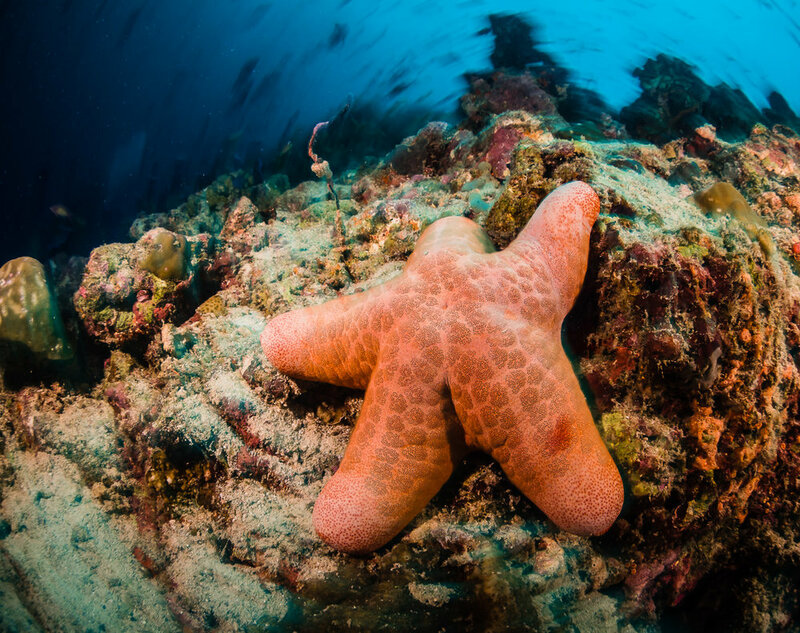 This shot of a fat starfish out in Indonesia, was shot using the exact same technique and broadly similar settings as to the two pictures above. However I’ve used it to illustrate a potential side effect. And this is that if you’re trying to get the background exposure sufficiently bright, at the apertures sufficiently small to keep a subject this close sharp, you may well find that the shutter speed forced upon you to keep the background exposure right, may well be quite slow. In this case it was around a 1/30 second. And if i’d kept really still, then the background wouldn’t have had that circular blurring you can see radiating around my main subject. This was for deliberate effect, and I will do another blog at a later date about deliberate motion blur like this called a twirl. It’s worth bearing in mind though as you may well find yourself shooting at slower shutter speeds, if you’re apertures are quite small. I’ve used a technique here to deliberately blur the background and give motion to an otherwise static shot. This is often a side effect of shooting at light sapping small apertures. This shot’s primary subject was the jellyfish closest to me and it was touching the dome port pretty much. The big difference from the previous two pictures was that this wasn’t shot using any strobe light. and instead I got up early to shoot at dawn. Hoping to light the translucent jellies with the early morning sun. I’d seen these jellies gathering in a small bay on the dusk dive the night before, and planned with another diver keen to get up early, to get in and shoot them. This was another shot where I ‘shot from the hip’ pointing the camera rig skywards straight at the surface. Worth getting up early if you see a potential shot in the making. It doesn’t always work out but when it does it’s worth it and your post dive breakfast seem all the more lovely. The main difficulty shooting straight up like this, is avoiding your bubbles in the shot. Another problem is the camera picking another jelly to focus upon, rendering the one you want annoyingly out of focus. So prefocussing is again the answer here, and once set, just move your camera around, taking shots, and reviewing and checking focus on screen. Whilst the previous shots, once setup didn’t take many to get the right one in the bag, this one took loads, as there was a load of jelly shaped variables all moving around the frame randomly, so it was a case of persevering until I got the framing and position of the lead jelly fish in the preferred spot in the frame. The final shot in this example of close focus wide angle shooting is taken at the opposite end of the normal dive day from the last. I love a dusk dive and the graduation over time from light to dark, and this picture was taken when the sun had well set, and it was essentially well into night dive territory. 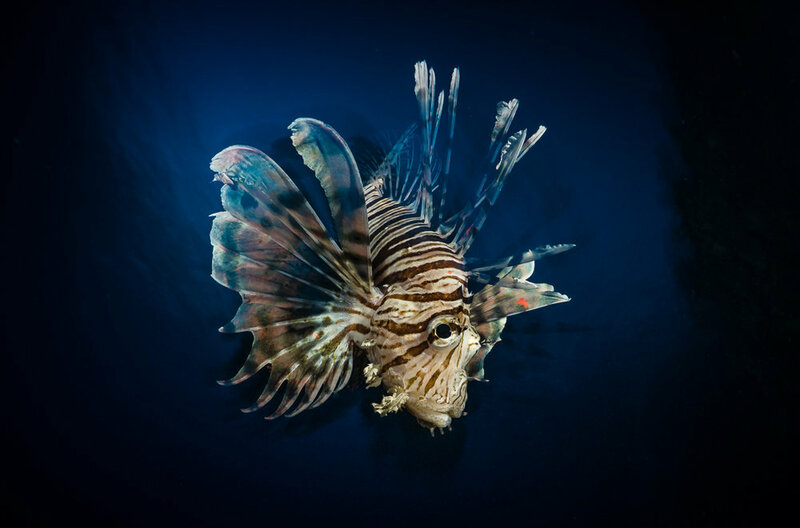 As i'm sure you may be aware Lionfish which are very plentiful in the Red Sea where this was shot, are not hard subjects to find. And will be drawn towards your focus light or torch. This one hung around me using the light from my torch to hunt. Shooting it side on meant that as there was very little background light, the background went pitch black at regular camera settings, that suited the correct foreground exposure. Similar to examples earlier, I’ve used a smaller aperture around f16 to give sufficient depth of field, and at night or dusk this resulted in a black background. I wanted a bit of blue in the background, but the only way to do this was to use the same positioning as in the shot of the jellies, and point the camera straight up towards the surface with the Lionfish between. This presented a focussing dilemma, as to keep a bit of blue in the background at the small apertures I was using meant that in the gloom my camera was indicating around a 2 second exposure, yes that’s right a whole 2 seconds ! So how is the subject not all blurry then? Well it’s pretty straightforward really when you get a grasp of what is happening when you’re shooting with a strobe and this shot is an extreme example of that in action. Understanding exposure, time of day, and settings will come with practice especially if you try things in situations that you think may not be possible. What’s the worst that can happen? Your strobe or flash, is providing a very bright but more importantly brief burst of light. This is what is freezing the subject against the dark blue, black background. And as long as you keep relatively still across the duration of a shot like this with an indistinct background, then the subject will be frozen by the foreword burst of light, any motion blur completely lost to underexposure. So there’s often a way round a difficult situation, and if you don’t try these things you won’t find out. Shooting close focus wide angle with your fisheye lens is very rewarding when it all works out, and it is a very good exercise in getting to grips with things like the exposure triangle, and utilising the camera controls to your advantage rather than being at the mercy of them. Effectively mixing strobe and available light to your taste. You’ll really feel a sense of satisfaction when you get to grips with shooting situations that push you and your cameras boundaries, and will progress still higher up the learning curve. If you want more specific advice or have a suggestion for a blog subject feel free to get in touch, details on how to do this are on our contact page. Do the same if you'd like a quote for equipment or to book on one of our courses or workshops (dates are on our Events page). Anyone with an interest in photography is welcome to join the Alphamarine Photography Q and A Facebook group as long as you behave yourself and stick to the rules.